Shailly Hair & Beauty possesses expertise in providing services for Eyebrow Shaping With Threading in Brisbane. We have a personnel of specialized beauticians who excel at the art of shaping eyebrows with threading, according to what suits your face best. Acquire our services for Eyebrow Shaping with Threading in Brisbane at nominal costs. .
With the support of dedicated professionals, Shailly Hair & Beauty offers specialized Face Threading Services in Brisbane. Get the perfect marble skin with our Face Threading Services. Our beauticians are adept at cleaning the face using threads, which is a pain free and effecting method for getting rid of the facial hair. Face Threading is a bliss for people who cannot tolerate the pain of bleaching. .
Shailly Hair and Beauty offers specific Eyebrow Threading in Brisbane. 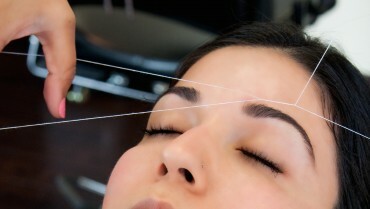 Get the ideal marble skin with our Eyebrow Threading Services. We have a faculty of specific beauticians who exceed expectations at the craft of Eyebrow Threading, as indicated by what suits your face best.